Working in secret, a cabal under Angelo Roncalli/John XXIII developed a secret schema for the “Second” Vatican Council that supplanted the one that had been developed by a team under the supervision of Alfred Cardinal Ottaviani, who was the head of the Holy Office. As noted in Culpably Blind last month, the man who masterminded the hijacking of the schema was none other than the doctrinally, liturgically and morally corrupt Giovanni Battista Enrico Antonio Maria Montini, then the Archbishop of Milan. This hijacking represented the conciliar revolutionaries’ mode by which they would use “bait and switch” efforts” to lull “conservatives” to sleep before they, the revolutionaries, used a blitzkrieg to implement the plans that they had made far in advance. The teleology of error is such that one falsehood must multiply into many other falsehoods over the course of time, and the counterfeit church of conciliarism so replete with error as to make whatever decisions its officials take at one time subject to the same kind of “reevaluation” and “adjustment” with which they have dismissed the dogmatic decrees of Holy Mother Church’s twenty legitimate general councils and the defense of dogmatic truth by our true popes. What one conciliar “pope” does can be undone by the next conciliar “pope,” and no conciliar “pope” has been more intent on undoing anything approximating Catholicism that had been maintained prior to his “election” on March 13, 2013, than Jorge Mario Bergoglio. The Argentine Apostate has engaged in a systematic process of filling the conciliar curia with his fellow Jacobin/Bolshevik revolutionaries, some of whom have nominated and receive antipapal approbation for nominees to Vatican academies and councils who are not at odds with the binding precepts of the Divine Positive Law and the Natural Law but who have made active war against them in the abject, open and unapologetic promotion of evil. here is a “moral obligation to guarantee the vaccination coverage necessary for the safety of others,” added the PAV in its 2017 statement. erome says the ban discriminates against him because of his religious beliefs. Contraception and surgical abortion are all about the money, blood money to be accurate. Planned Barrennhood is now and has always been about the money, a point that is made in a documentary, “Unplanned,” that is debuting this week in motion picture theaters. Although I do not go to movies—and have done only for three movies (Therese, which was disappointing, The Passion of the Christ and, of course, For Greater Glory) the past twenty years—and will not do so during Lent, it is my understanding that “Unplanned” is a powerful statement against Planned Barrennhood in very graphic terms, although I never underestimate the public’s ability to ignore truth even on the natural level and/or to be unmoved by it. The pharmaceutical industry is not about “making us healthy.” It is about the money, which it makes in bundles and bundles by convincing physicians and hospitals to purchase their wares that are filled with poisons and are approved for marketing without proper safeguards and with built-in profit-margins that contain budget amounts for payouts as they expect a certain percentage of patients to die from their use. Moreover, save for a few notable and very rare exceptions, most of the graduates of medical schools and colleges throughout the course of the Twentieth Century, including in supposed “halcyon days” of the 1950s that were not so great, were indoctrinated by the bilge about the “safety” of various pharmaceutical products and how vaccines were responsible for eliminating outbreaks of diseases. Lies. All lies. Ah, you doubt my word. “The great expectations held for DDT have been realized. During 1946, exhaustive scientific tests have shown that, when properly used, DDT kills a host of destructive insect pests, and is a benefactor of all humanity. Pennsalt produces DDT and its products in all standard forms and is now one of the country’s largest producers of this amazing insecticide. 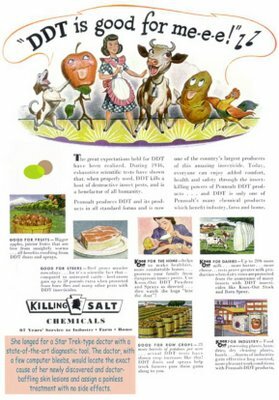 Today, everyone can enjoy added comfort, health and safety through the insect-killing powers of Pennsalt DDT products . 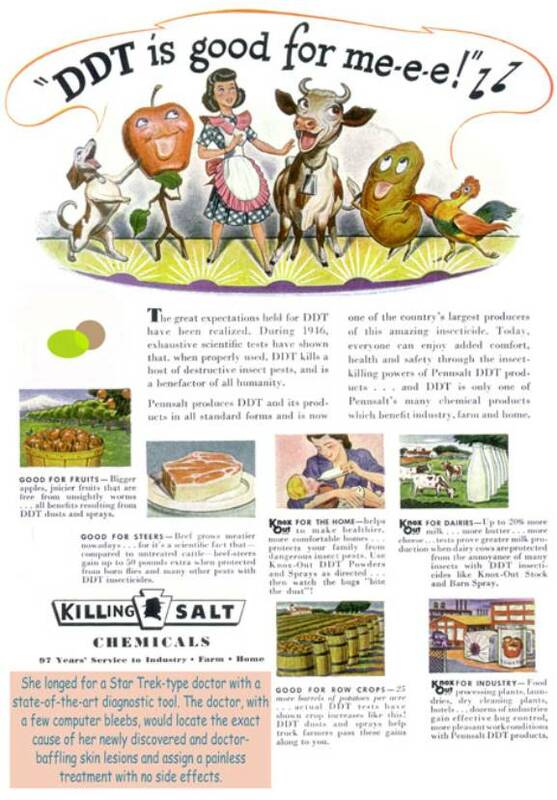 . . and DDT is only one of Pennsalt’s many chemical products which benefit industry, farm and home. GOOD FOR FRUITS – Bigger apples, juicier fruits that are free from unsightly worms . 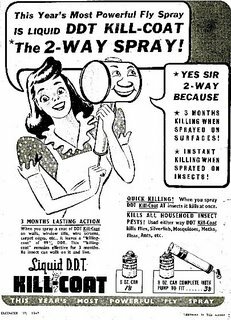 . . all benefits resulting from DDT dusts and sprays. GOOD FOR STEERS – Beef grows meatier nowadays . . . for it’s a scientific fact that compared to untreated cattle beef-steers gain up to 50 pounds extra when protected from horn flies and many other pests with DDT insecticides. FOR THE HOME – Helps to make healthier and more comfortable homes . . . protects your family from dangerous insect pests. 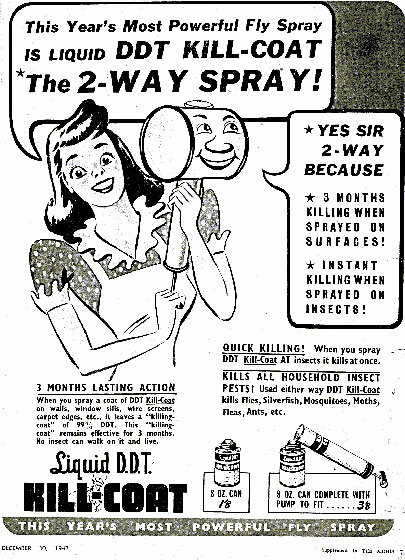 Use Knox-Out DDT Powders and Sprays as directed . . . then watch the bugs ‘bite the dust’! FOR DAIRIES – Up to 20% more milk . . . more butter . . . more cheese . . . tests prove greater milk production when dairy cows are protected from the annoyance of many insects with DDT insecticides like Knox-Out Stock and Barn Spray. GOOD FOR ROW CROPS – 25 more barrels of potatoes per acre . . . actual DDT tests have shown crop increases like this! DDT dusts and sprays help truck farmers pass these gains along to you. As Dr. Suzanne Humphries notes in a very compelling and informative video (see Dr. Suzanne Humphries on the smallpox vaccine), the government, the media and, of course, the pharmaceutical/medical industrial complex of death have been lying to us ever since the development of vaccines in the Nineteenth Century. The lies that have been told us even when many of us “baby boomers” were getting vaccines aplenty are astounding, and this is from one who had to be convinced of the vaccine scam in 2001 by several people. The evidence is there. Only the willfully blind refuse to see it as we have been conditioned to accept whatever the government and the medical industry insist is “good” for us. Dr. Humphries explains the vaccinators have changed the definition of illnesses such as poliomyelitis in order to convince the general populace that they are at risk for contracting polio. Dr. Jim West, who is known to at least a few readers of this site, also debunked the causes of polio in an article that he wrote in 2002 and was posted in 2015 at another website; see Everything You Learned About the Cause of Polio is Wrong. All one really has to know about the vaccine scam is that the draconian Cold Spring Harbor Laboratory, which is fully funded by the Rockefeller Foundation, was instrumental in pushing the propaganda used to condition us about the “necessity” of vaccines for one’s personal health and for public safety. Yes, I know full well that some of true popes got vaccinated and that true priests led processions of their parishioners to get vaccinated. Pope Pius VII even said that the development of the smallpox vaccine was an instrument of God’s omnipotence. I am not casting aspersions on them. However, we know more now than they did when they lived, and most of what is known, as Dr. Humphries documents fully, is based upon the evidentiary paper trail left us by the so-called “medical professionals,” alleged scientists and pharmaceutical company executives that documented how vaccines failed to work. These alleged guardians of “public health” also documented how they changed the definitions of the various diseases the vaccines were said to have cured in order to cover-up the fact of their failure to do what they had told the public had been accomplished. First, decrees issued by the conciliar authorities on matters pertaining to Faith and Morals carry no authority at all to bind the faithful. This has been true from the time of Angelo Roncalli/John XXIII to that of Jorge Mario Bergoglio, who is in Morocco at this time promoting the apostate document that he signed in Abu Dhabi, United Arab Emirates on January 19, 2019. Too bad vaccines don’t work as I, for one, would love to have a vaccine that kept the world safe from Jorge Mario Bergolio and conciliarism. Second, decrees issued by the conciliar authorities under Jorge Mario Bergoglio invariably wind up supporting the promotion of sin under the cover of “compassion” and/or “accompaniment” and are reliably supportive of every falsehood promoted by pro-abortion, pro-sodomite, statist, open-borders and anti-family politician on the face of the earth, including the Chicoms, whose bidding he has done by throwing underground Catholics in Red China to them to persecute with antipapal approbation. Although the Antipapal Assembly for Death did not rule directly about the aforementioned case in Kentucky and a 2017 statement Paglia issued concerned an outbreak of measles in Italy, Zigmunt Zimoski, the president of the “Pontifical” Council for Pastoral Assistance to Health Care Workers,” did issue a “New Charter for Health Care Workers” that was translated into English by the National Catholic Bioethics Center of Philadelphia, Pennsylvania. The “new charter,” which supports the lies of the inversion of the ends proper to Holy Matrimony, “natural family planning,” the medical industry’s manufactured, money-making myth of “brain death,” vital organ “donation” and transplantation, and vaccinations, including the use of vaccines derived from “biological material” that have some “association” with the cells of butchered babies. It is on the basis of this “new charter” that Vincenzo Paglia’s Antipapal Assembly for Death has ruled it permissible to use vaccines derived from the cells of butchered children. Here is the relevant passage from the “New Charter for Health Care Workers, interspersed with my own interjections. The employment of “vaccines in the fight against” infectious diseases, through the obligatory immunization of all populations concerned, is undoubtedly a positive step”? Big Government, that’s who (two). Vaccines have nothing to do with public health, and the passage of laws and issuance of decrees and directives mandating the obligatory immunization of all citizens represents a draconian effort on the part of social engineers to engage in the control of the population. Once again, you see, the Rockefeller Foundation and its offshoot, the Cold Spring Harbor Laboratory, do not have public health and safety in mind. They are concerned about an ideological agenda that is opposed to that which constitutes the true public good, namely, the eternal good of souls upon which all just scientific and medical decisions and treatments must be based. "The possession and enjoyment of all rights are subject to such reasonable conditions as may be deemed by the governing authority of the country essential to the safety, health, peace, good order and morals of the community. Even liberty itself, the greatest of all rights, is not unrestricted license to act according to one's own will. It is only freedom from restraint under conditions essential to the equal enjoyment of the same right by others. It is then liberty regulated by law." In the constitution of Massachusetts adopted in 1780, it was laid down as a fundamental principle of the social compact that the whole people covenants with each citizen, and each citizen with the whole people, that all shall be governed by certain laws for "the common good," and that government is instituted "for the common good, for the protection, safety, prosperity and happiness of the people, and not for the profit, honor or private interests of anyone man, family or class of men." The good and welfare of the Commonwealth, of which the legislature is primarily the judge, is the basis on which the police power rests in Massachusetts. Commonwealth v. Alger, 7 Cush. 53, 84. Although the author of this excellent analysis does not understand that the triumph of utilitarianism is the result of the overthrow of the Social Reign of Christ the King wrought by the Protestant Revolution and the subsequent rise and institutionalization of the naturalistic precepts of Judeo-Masonry, the truth remains that trusting in the infallibility of the medical industry now is even more dangerous than it was in 1905. The assertion made about the “necessity” of compulsory vaccinations in the text of “New Charter for Health Care Workers” is gratuitous and contrary to fact. The preparation of certain vaccines occasionally involves the use of “biological material” of illicit origin, for example, in the cell lines developed from deliberately aborted fetuses. The ethical problems here are essentially cooperation with evil and scandal, because of a grave disorder against the life and integrity belonging to every human being. The duty remains for everyone to manifest disagreement with the use of biological material of illicit origin for the preparation of vaccines and to ask health care systems to make other types of vaccines available. In some cases, researchers utilize “biological material” that was not directly produced by those who make use of it, but acquired commercially; in these situations, one can invoke the criteria of independence, that is, the absence of proximate connection to illicit practices. Nevertheless, the researchers, in their professional activity, have the duty to avoid scandal. Hence “there is a duty to refuse to use such ‘biological material’ even when there is no close connection between the researcher and the actions of those who performed the artificial fertilization or abortion, or when there was no prior agreement with the centers in which the artificial fertilization took place. This duty springs from the necessity to remove oneself within the area of one’s own research, from a gravely unjust legal situation and to affirm with clarity the value of human life. The conciliar Vatican clearly accepts the utility of effective of vaccinations. How can someone who is unvaccinated and contracts measles able to transmit the disease to those who are vaccinated? Isn’t the whole point of the vaccination-scam to “protect” people? How can those who are “protected” get infected by people who are not? What’s the big deal about getting measles? Many of us got them. We survived. Many of us got and survived chicken pox and the mumps. The human body was designed to fight off these diseases. What about the power of the Miraculous Medal, which protected people in France from outbreaks of disease in the Nineteenth Century? Whatever vaccines were sixty years ago, however, they are not now. This is true even of vaccines administered by veterinarians, including those, such as rabies, that state law mandates to be given. Our own Chase developed a sarcoma at the base of his neck just above his spine in January of 2015 in the exact spot where he had received a rabies vaccination twelve months before. The veterinarian, who is a pioneer in the use of alternative treatments (chiropractic, electro-acupuncture, laser treatment, his own naturopathic formulae), excised the tumor surgically upon discovery. However, it grew back in an operable place under his neck a year later, and he had to be euthanized over three months ago now. The veterinarian, who is seventy-seven years of age, knows the harmful nature of the vaccines. He told me that of least one other case as Chase’s in his practice. However, this is an instance where a veterinarian has to comply with the state mandate or lose his license. This having been noted, it is important to point out that even though the “New Charter for Health Care Workers” is aimed principally at guiding those who work in the health care industry, including medical researchers, the section on vaccinations does have relevance to the situation in Kentucky, especially in light of Antipapal Assembly of Death’s acceptance of the moral liceity of such vaccines. Alas, this is not a complex matter at all once one recognizes (a) one can have nothing to do with abortion; and (b) that vaccine scam is based on one false premise after another. Does an evil act because less evil because it was committed forty years ago? The passage of time can never conference legitimacy on that which is illegitimate. It is this simple. There is no need for the moral casuistry of the Vatican relativists who seek to complexify every situation facing Catholics who are confronted with demands from the omniscient, omnipotent statist overlords who want to control us even while they insist that they believe in “freedom of choice.” Sure, we have “freedom of choice,” all right. We have the “freedom of choice” to agree with them or suffer their wrath. The situation in the supposedly “free” West is slightly different, at least visibly, than in, say, Red China, where everyone is under compulsion to do what the state says or suffer monstrous fines. There is no such thing as legitimate freedom of conscience exemptions in a Communist tyranny, thus forcing Catholics who know better to be injected with the poisons that may cause serious health problems over the course of their lifetimes. We are getting closer and closer to that point to be sure (see (Rockland County, New York, Bans Unvaccinted Minors from Churches and other public places during measles outbreak and Protests Erupt over Unvaccinated Child Ban In Rockland County, New Yorks ), and when we do have at it formally, of course, the officials within the conciliar Vatican will be the first to make sure those of us who resist receive the maximize penalties allowable under the law after, that is, we are forced to be vaccinated with the poisons that are said to be so very good for us and for the good of public health. The whole vaccination scam is designed to destroy human immune systems and to give the pharmaceutical companies and governmental decisions more and more power over the lives of ordinary citizens. The medical industry has lied to us about the "safety" of contraception, which can never be safe on natural level as that which is unsafe for the soul is inherently unsafe for the body. Contraception is a lie as it denies the Sovereignty of God over the sanctity and fecundity of Holy Matrimony. The medical industry has lied to us about the "safety" of surgical abortion, which is deadly to an innocent baby, harmful to the body and soul of his mother and destructive of the just order of men and their nations. The medical industry has lied to us about the "safety" of overt pharmaceutical abortifacients such as RU-486, which has killed women in addition to killing babies and the souls of their mothers and those who manucture, market and dispense them at a retail level with the full knowledge of being complicit in an abortion. The medical industry has lied to us about the "fact" of brain death, which has made possible the killing off of innocent beings to faciliate the the vivisection of their bodily organs in order to "give the gift of life." The medical industry has lied to us about the "necessity" of starving and dehydrating to die persons said to be in a "persistent vegetative state." (Yesterday, March 31, 2019, was the fourteenth anniversary of the court-ordered death of Mrs. Theresa Maria Schindler-Schiavo, who died on March 31, 2005, after she had been starved and dehydrated for thirteen grueling days of state-sponsored torture (see Ten Years Later). The medical industry has lied to us about the "compassion" of "palliative care," which is nothing other than a carefully supervised execution of a human being who is either terminally ill or said to be suffering a loss of a "quality of life" because of a chronic illness or even because the "team" of health care professionals deem that he is better off dead than alive. The medical industry has lied to us the "dignity" of "doctor-assisted suicide," which denies the Sovereignty of God over the inviolability of innocent life just as does abortion. New Jersey has become the latest state to "legalize" this lie (see New Jersey Governor Vows to Sign Bill Allowing Doctors to Help Kill Terminally Ill Patients). Big Pharm has lied to us about the "safety" and the "benefits" of various products that have killed people. Mad scientists, believing in their own omnipotence and omniscience, have lied about their work in gene-editing, human cloning and eugenics so that they can spring their "findings" as faits accompli for a public distracted by bread and circuses to admire with due reverence and acceptance. Why should we believe that these combined forces are telling us the truth about the "safety" of vaccinations and even about the history of these vaccinations and their supposed effectiveness? Why should we believe the assurances given by the government of the United States of America and global organizations such as the United Nations and the World Health Organization about the "safety" of food additives, preseveratives, artificial sweeteners and vaccines, some of which contain sterilizing agents to wipe out the popuations of Third World countries (see, for example, Mass Sterilization Exercise: Kenyan Doctors Find Anti-Fertility Agent in UN Tetanus Vaccine)? 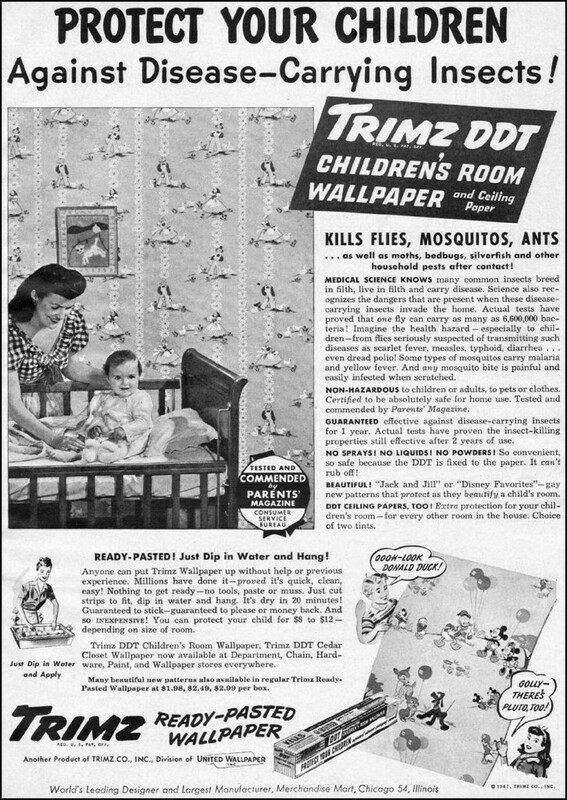 Remember, the government assured us that "DDT is safe for me-e-e". Trusting the doctors and the government to get ourselves microchipped if we want to board an airplane (not that I do) or simply to "assure" the public safety by being able to identify (and to control) us and our activities? At what point do we say, "This is enough, I will not believe in the lies told by people who do hate Christ the King and His true Church and who do not have either the temporal or eternal good of souls in mind"? It has become an article of the secular “faith” to treat the high priests and priestesses of science with unfailing deference. Moreover, Modernity is built on the lie that the Incarnation, Nativity and Redemptive Act of Our Blessed Lord and Saviour Jesus Christ are matters of complete indiffence to medicine, science, commerce, banking, politics, government, education and what passes for "popular culture," and Modernism, which has propagated its own lies on matters of Faith, Worship and Morals that contradict the teachings of Holy Mother Church's true general councils and her true popes and have deconstructed the teaching of the Church Fathers on doctrine and Sacred Scripture, has made its reconciliation with the lies of Modernity and propagated a false religion that yields in almost all instances to those high priests and priestesses of these fields. We cannot believe in these lies as each is from the master of lies and the prince of darkness, the adversary himself. When are we going to learn that all must fall apart without the Social Reign of Christ the King as it must be exercised by His true Church? As noted earlier in this commentary, we are suffering the consequences of Protestantism’s overthrow of the Social Reign of Christ the King and the innumerable plots of the various factions of the synagogue of satan (Judeo-Masonry, which includes all forms of naturalism, viz. political “philosophies” and ideologies) in every aspect of our lives bar none. Our situation is going to get worse, not better, over time as not even the “make America great campaign” of President Donald John Trump includes clamping down on Big Pharm and Big Ag and Fake Science as too many money passes hands and too many lies have been accepted as truth for this to happen. We must suffer. We are being chastised justly for our own sins. We must pray to Our Lady, especially by means of her Most Holy Rosary and as the consecrated slaves of her Divine Son through her own Sorrowful and Immaculate Heart according to the teaching of Saint Louis de Montfort’s True Devotion to Mary so that we will surrender our very liberty to her so that she will dispose of all our prayers, good works, sacrifices and sufferings as she sees fit for the honor and glory of the Most Blessed Trinity and the good of souls. (See the Appendix below for an excerpt from True Devotion to Mary). We need Our Lady’s maternal assistance and the graces that flow forth through her loving hands to drive out the demons from our souls lest we, having fought the demons of this passing world, die without having cooperated with those graces to do battle first with the enemies of our salvation, which are ultimately far more important to contend with than those who can harm and kill the body alone. 120. As all perfection consists in our being conformed, united and consecrated to Jesus it naturally follows that the most perfect of all devotions is that which conforms, unites, and consecrates us most completely to Jesus. Now of all God's creatures Mary is the most conformed to Jesus. It therefore follows that, of all devotions, devotion to her makes for the most effective consecration and conformity to him. The more one is consecrated to Mary, the more one is consecrated to Jesus. In other words, we give her all that we possess both in our natural life and in our spiritual life as well as everything we shall acquire in the future in the order of nature, of grace, and of glory in heaven. This we do without any reservation, not even of a penny, a hair, or the smallest good deed. And we give for all eternity without claiming or expecting, in return for our offering and our service, any other reward than the honour of belonging to our Lord through Mary and in Mary, even though our Mother were not - as in fact she always is - the most generous and appreciative of all God's creatures. 122. Note here that two things must be considered regarding our good works, namely, satisfaction and merit or, in other words, their satisfactory or prayer value and their meritorious value. The satisfactory or prayer value of a good work is the good action in so far as it makes condign atonement for the punishment due to sin or obtains some new grace. The meritorious value or merit is the good action in so far as it merits grace and eternal glory. Now by this consecration of ourselves to the Blessed Virgin we give her all satisfactory and prayer value as well as the meritorious value of our good works, in other words, all the satisfactions and the merits. We give her our merits, graces and virtues, not that she might give them to others, for they are, strictly speaking, not transferable, because Jesus alone, in making himself our surety with his Father, had the power to impart his merits to us. But we give them to her that she may keep, increase and embellish them for us, as we shall explain later, and we give her our acts of atonement that she may apply them where she pleases for God's greater glory. 123. (1) It follows then: that by this devotion we give to Jesus all we can possibly give him,and in the most perfect manner, that is, through Mary's hands. Indeed we give him far more than we do by other devotions which require us to give only part of our time, some of our good works or acts of atonement and penances. In this devotion everything is given and consecrated, even the right to dispose freely of one's spiritual goods and the satisfactions earned by daily good works. This is not done even in religious orders. Members of religious orders give God their earthly goods by the vow of poverty, the goods of the body by the vow of chastity, their free will by the vow of obedience, and sometimes their freedom of movement by the vow of enclosure. But they do not give him by these vows the liberty and right to dispose of the value of their good works. They do not despoil themselves of what a Christian considers most precious and most dear - his merits and satisfactions. 124. (2) It follows then that anyone who in this way consecrates and sacrifices himself voluntarily to Jesus through Mary may no longer dispose of the value of any of his good actions. All his sufferings, all his thoughts, words, and deeds belong to Mary. She can then dispose of them in accordance with the will of her Son and for his greater glory. This dependence, however, is without detriment to the duties of a person's present and future state of life. One such duty, for example, would be that of a priest who, by virtue of his office or otherwise, must apply the satisfactory or prayer value of the Holy Mass to a particular person. For this consecration can only be made in accordance with the order established by God and in keeping with the duties of one's state of life. 125. (3) It follows that we consecrate ourselves at one and the same time to Mary and to Jesus. We give ourselves to Mary because Jesus chose her as the perfect means to unite himself to us and unite us to him. We give ourselves to Jesus because he is our last end. Since he is our Redeemer and our God we are indebted to him for all that we are. 126. I have said that this devotion could rightly be called a perfect renewal of the vows and promises of holy baptism. Before baptism every Christian was a slave of the devil because he belonged to him. At baptism he has either personally or through his sponsors solemnly renounced Satan, his seductions and his works. He has chosen Jesus as his Master and sovereign Lord and undertaken to depend upon him as a slave of love. This is what is done in the devotion I am presenting to you. We renounce the devil, the world, sin and self, as expressed in the act of consecration, and we give ourselves entirely to Jesus through Mary. We even do something more than at baptism, when ordinarily our god-parents speak for us and we are given to Jesus only by proxy. In this devotion we give ourselves personally and freely and we are fully aware of what we are doing. In holy baptism we do not give ourselves to Jesus explicitly through Mary, nor do we give him the value of our good actions. After baptism we remain entirely free either to apply that value to anyone we wish or keep it for ourselves. But by this consecration we give ourselves explicitly to Jesus through Mary's hands and we include in our consecration the value of all our actions. 127. "Men" says St. Thomas, "vow in baptism to renounce the devil and all his seductions." "This vow," says St. Augustine, "is the greatest and the most indispensable of all vows." Canon Law experts say the same thing: "The vow we make at baptism is the most important of all vows." But does anyone keep this great vow? Does anyone fulfil the promises of baptism faithfully? Is it not true that nearly all Christians prove unfaithful to the promises made to Jesus in baptism? Where does this universal failure come from, if not from man's habitual forgetfulness of the promises and responsibilities of baptism and from the fact that scarcely anyone makes a personal ratification of the contract made with God through his sponsors? 128. This is so true that the Council of Sens, convened by order of the Emperor Louis the Debonair to remedy the grave disorders of Christendom, came to the conclusion that the main cause of this moral breakdown was man's forgetfulness of his baptismal obligations and his disregard for them. It could suggest no better way of remedying this great evil than to encourage all Christians to renew the promises and vows of baptism. 129. The Catechism of the Council of Trent, faithful interpreter of that holy Council, exhorts priests to do the same and to encourage the faithful to remember and hold fast to the belief that they are bound and consecrated as slaves to Jesus, their Redeemer and Lord. "The parish priest shall exhort the faithful never to lose sight of the fact that they are bound in conscience to dedicate and consecrate themselves for ever to their Lord and Redeemer as his slaves." 130. Now the Councils, the Fathers of the Church and experience itself, all indicate that the best remedy for the frequent lapses of Christians is to remind them of the responsibilities of their baptism and have them renew the vows they made at that time. Is it not reasonable therefore to do this in our day and in a perfect manner by adopting this devotion with its consecration to our Lord through his Blessed Mother? I say "in a perfect manner", for in making this consecration to Jesus they are adopting the perfect means of giving themselves to him, which is the most Blessed Virgin Mary. 131. No one can object that this devotion is novel or of no value. It is not new, since the Councils, the Fathers of the Church, and many authors both past and present, speak of consecration to our Lord or renewal of baptismal vows as something going back to ancient times and recommended to all the faithful. Nor is it valueless, since the chief source of moral disorders and the consequent eternal loss of Christians spring from the forgetfulness of this practice and indifference to it. 132. Some may object that this devotion makes us powerless to help the souls of our relatives, friends and benefactors, since it requires us to give our Lord, through Mary, the value of our good works, prayers, penances, and alms-giving. (1) It is inconceivable that our friends, relatives and benefactors should suffer any loss because we have dedicated and consecrated ourselves unconditionally to the service of Jesus and Mary; it would be an affront to the power and goodness of Jesus and Mary who will surely come to the aid of our relatives, friends and benefactors whether from our meagre spiritual assets or from other sources. (2) This devotion does not prevent us from praying for others, both the living and the dead, even though the application of our good works depends on the will of our Blessed Lady. On the contrary, it will make us pray with even greater confidence. Imagine a rich man, who, wanting to show his esteem for a great prince, gives his entire fortune to him. Would not that man have greater confidence in asking the prince to help one of his friends who needed assistance? Indeed the prince would only be too happy to have such an opportunity of proving his gratitude to one who had sacrificed all that he possessed to enrich him, thereby impoverishing himself to do him honour. The same must be said of our Lord and our Lady. They will never allow themselves to be outdone in gratitude. 133. Some may say, perhaps, if I give our Lady the full value of my actions to apply it to whom she wills, I may have to suffer a long time in purgatory. This objection, which arises from self-love and from an unawareness of the generosity of God and his holy Mother, refutes itself.